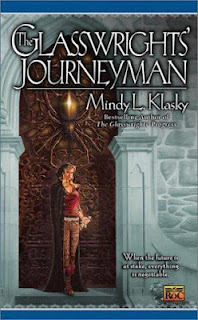 The Glasswrights' Journeyman is the third book in Mindy L. Klasky's Glasswrights' Guild series, featuring smart and resourceful heroine Rani Trader. It's been three years since glasswright apprentice Rani Trader saved hundreds of children from the evil Sin Hazar in The Glasswrights' Progress. Now at the age of 18, Rani is more than ready to rebuild her beloved guild from the ground up, especially considering her guild was destroyed and disbanded years ago after King Hal's brother was assassinated. However, since a mysterious fire has ravaged the entire city of Morenia, rebuilding the Glasswrights' Guild is hardly a high priority. Lacking the funds and resources to get Morenia back on its feet, King Hal's best option for saving his kingdom is to marry the ugly and shy, cross-eyed princess of Liantine for her dowry. After traveling to Liantine with King Hal and the rest of the Morenian court, Rani realizes that the largest opportunity for making money lies with the Octolaris Spiderguild. Using her knowledge and experience as a marketplace negotiator, Rani devises a plot to save the kingdom of Morenia using the valuable silk-spinning spiders, especially if it means that the Glasswright's Guild can also be reinstated. Klasky's Glasswright series keeps getting better and better with each book. Since Rani and Mair are now adults, the ongoing storylines (especially the romances!) grow steadily more intense with each chapter. Klasky's rich, complex world will keep you on your toes - there is nothing at all predictable about these books, and the characters in them. With new characters constantly being introduced to the series, Rani now appears to be juggling several ongoing love interests. It'll definitely be interesting to see who Rani ends up with from a relationship standpoint, although I'm still rooting for King Hal. Is it even possible that they can be together? Probably not. Many unanswered questions linger after The Glasswrights' Journeyman. Who started the fire that ruined Morenia? Does King Hal truly love Rani although he won't admit it, and vice versa? Does the Fellowship have good intentions, or are they really evil? The aching desire to have these questions answered will leave readers anxious for the next book in the series. What are your favorite fantasy series? 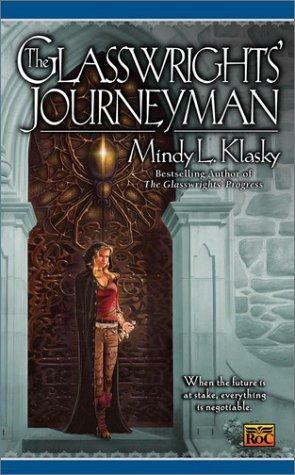 Have you read any other novels by Mindy L. Klasky and if so, what did you think? Share your thoughts with us below.